An ALT tag should be used within the image to provide a clear text alternative. 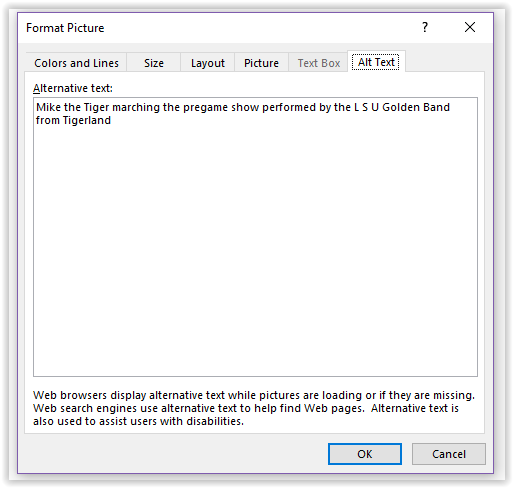 Alternative text should be used for all images and graphics so that screen readers can let the user know the purpose of that image. The ALT text should also include context that is relevant to the Web page. If an image is used as a link then the alternative text should describe the destination of the link, not a description of what the image is. Text with acronyms need spaces between the letters so that they can be read individually instead of the screen reader attempting to form words (<alt="I T S at L S U">). The ALT tag descriptions should not be any longer than 125 characters because of certain restrictions with the JAWS screen reader breaking text into blocks of 125. Complex images like charts and diagrams should include a link to an extended text caption that describes the image in more detail. Labels must be provided for each formula or equation regardless of whether it is an image or in text. Screen readers may not be able to recognize certain symbols. In this case, pronunciation files may be necessary to read symbols like "≠" with "does not equal". Text equivalents for every image or animation are necessary for a page to be accessible for screen readers. Avoid automatic or looping animations because of their potentiality to trigger seizures in the screen reading and could interfere with those who use speech recognition software in their Web use. Media editors like Real Player and Windows Media include captioning options for their videos. They are typically stored in an external file that can be edited for visually impaired users as they may need more descriptive information about images and videos.